Much of this information comes from Chapter Four of Digital Storytelling in the Classroom: New Media Pathways to Literacy, Learning and Creativity. However, also included on this site are rubrics created by teachers and students I have worked with over the years. Remember - the most important aspect of a rubric is your ability to explain it to others, especially to yours students. Feel free to use any of the rubric material you find here, but I recommend you personalize it so it makes complete sense to you. Set clear goals. While I appreciate that this sounds like something Capt. Obvious would say, this is particulalry important when it comes to student new media projects for the following simple reason. When students prepare written work you can always judge the quality of their writing, whether you know much about the subject or not. But when students prepare new media like digital stories, this fallback position vanishes because most teachers don't feel comfortable assessing new media narrative. This is understandable, given that many teachers have created little new media themselves, and certainly weren't taught how to assess it in their teacher education programs. So, the only fallback position available to them becomes: did students meet the goals of the project? Assess everything. The final story is the tip of the iceberg. Preparing a digital story involves writing, creating artwork, preparing planning documents, and a number of other activities that produce tangible, assessable artifacts that address a number of intelligences, literacies and skill areas. A digital story is literally a portfolio unto itself. Try to assess as much of the formative work as you can. Assess the process. Did students plan well? Work in groups well? Much of what is transferrable from digital storytelling to other activities, media and non-media based, centers on planning skills. Include self-assessment and peer review. Include these whenever possible and appropriate. Media development relies on risk taking and honest self-assessment of the outcome. It also relies on a community of learners sharing their skills and insights. With this in mind, consider the following possible assessment traits. 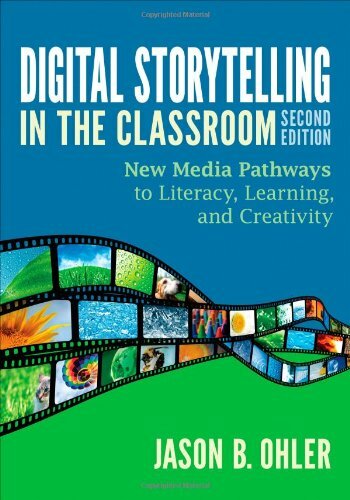 References to Part I, II and III here refer to the book from which this was excerpted, Digital Storytelling in the Classroom: New Media Pathways to Literacy, Learning and Creativity. This lists covers many but by no means all of the areas of a digital story. Focus on a few, typically three to six traits. Typically I have students develop rubrics with no more than five traits. More than this and the rubric becomes impractical within a classroom context of many students producing many digital stories. While my students are free to draw on the list below, many come up with their own traits, or with ways of describing the traits below in their own words. Directly following this list is an example produced by a teacher recently that I consider concise and very useful. Is there evidence of solid planning, in the form of story maps, scripts, storyboards, etc.? How well did the student follow the media development process covered in Part III? Was the student’s project well researched and documented? How well did the student meet the academic goals of the assignment and convey an understanding of the material addressed? Did you require stories to be under two minutes, use no more than 10 images and 30 seconds of music and provide citations in MLA format? Whatever your criteria, be clear and stick to them. What was the quality of the student’s written work exhibited in the planning documents, research, etc.? How creative was the production? Did the student exhibit an original sense of voice and a fresh perspective? Was the information presented through the story sifted, prioritized and told without bird walking or detours, as described in Part III? Was the story well organized? Did it flow well, moving from part to part without bumps or disorientation, as described in Part III? How effective was the student’s actual presentation or performance? This includes burning a DVD, posting the story on the Web site effectively, performing it before an audience, or whatever the assignment required. How well did the story respect the needs of the audience? Was the use of media appropriate, supportive of the story, balanced and well considered? How “bumpy” was the story? Media grammar and its relation to “bumps and squints” are described in Part III. There are many facets of media grammar, and you may want to choose a few to focus on. Has everything that is not original been credited, as described in Part III? Have permissions been obtained where necessary? Do citations appear in the format required by the project? Often, your standards are just fine. Story core clear, articulated, compelling? Research clear, thorough, integrated (rather than listed)? Length, number of elements, audience consideration (poem vs. essay) etc.? Was it a quality story that made listeners lean forward and wonder what was going to happen next? Did it flow, without bird walks or bumps? If audience members had to work to understand it, was it worth their effort? Was the story neat, clean and complete? Was it crafted with care? Is the story original and told with a sense of personal voice? Did the student overcome problems and obstacles to pursue their story? Did the student take the time s/he needed to develop his or her ideas? Did s/he use class time wisely? Student is interested and engaged in working, uses his or her time wisely, and works appropriately with others. Student used a story map, board or other planning method that helped him or her think about how he or she would tell his or her story. Student sought feedback and thought critically about how to improve his or her story. Student thoughtfully explained how and why he or she chose to create his or her story. His or her answers to the questions are thorough, organized and creative. Student used images to creatively tell the story behind the words. Student uses his or her natural speaking voice, as well as music (optional) and effects (optional) to support (without taking away from) the meaning of his or her story. Student tells a PERSONAL STORY about an object, person, event or place that profoundly impacted him or her or someone he or she knows. Student's digital story articulates a clear message and tells a compelling and engaging story the view connects to emotionally. Alignment and integration of media sources: music, images, sound effects, voice over /15 pts. Clear Purpose - What is this film about? /15 pts. Consistent narrative: Is your story told through text, images, or music? /15 pts. Strong Contrast - The difference is clear, clean and compelling /15 pts. Cite sources for photos /5 pts. Cite source for music /5 pts. Rubistar - home of a gazillion rubrics (over 300 of which were related to digital storytelling, as of 2/2009). What is media grammar? "It's the term I use to describe the run-ons, fragments and other "grammatical infractions" that impede clear communication in a digital story." Media grammar was developed with content area teachers in mind, and assumes teachers are not necessarily media savvy. Thus, it does not address the finer points, or the high end, of media production. Instead it addresses the fundamental grammatical considerations that would be common to any content area and would assessible by any teacher, regardless of media production experience. An essay or a poem? The most important question a teacher needs to ask when embarking on a digital storytelling project with regard to media grammar and expression is this: are students producing essays or poetry? In fact, most are some combination of the two, so another way to ask this question is: Where on the continuum bounded by essay and poem does the assigment lie? With essays teachers rightfully expect students "to come to the reader." That is, the expression should be clear, and not cause the listener "to squint or bump" as they try to understand what the storyteller is trying to say. However, with poetry we, the audience, expect to work harder. We expect to "come to the writer," to re-read passages and puzzle over nuances. In this case it is acceptable, even expected, that the digital stories will be granted more grammatical leeway. Even if "essay vs. poem" is well defined for a project, teachers face another challenge. Because students are more versed in the language of media, their grammar may be more developed than their teachers. Therefore, it is up to teachers to decide whether what they are looking at is art or simply a project that needs more work, while being open to the possibility that students have a better grasp of new media expression than they do. For centuries teachers have been the keepers of the language. In the case of new media, often times they are not.